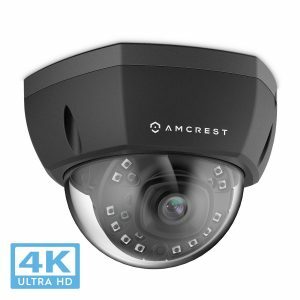 Amcrest (IP8M-2493) is a 2018 release 4K 8 mp UHD Vandal dome POE IP video security camera that is IP67 weatherproof and IK10 Vandal Resistant, with a 2.8mm lens, 3840×2160 pixel resolution, 98 feet IR night vision and MicroSD recording. You have two color options and can get it in either black (IP8M-2493EB) or white (IP8M-2493EW), which is a little cheaper. The footage is very high-quality thanks to the 3840×2160 pixels UltraHD 4K 8M resolution, Sony IMX274 Starvis Sensor which is a progressive scanning image sensor and the latest Ambarella S3L33M Chipset. You shall be able to cover and observe more space with the 69 to 112-degree viewing angle, offering an additional protection layer. Amcrest Dome Cam is very easy to set up (DIY installation) with the POE- Power Over Ethernet, but you will need a POE injector or switch for this as it is not included in the package. The distance between the PoE injector/switch and the dome camera should be a maximum of 300 feet. And you need to make sure the switch has the adequate number of ports for how many cams you wish to use. You will get smart alerts to your smartphone or PC with the Amcrest View app which will help you feel safer. The unit will record everything as soon as they happen and they will be stored on the microSD with a max capacity of 128GB. 4 hours of free video storage can be accessed from any devices including Mac, iPad, Windows PC, Android or iOS iPhone. The footage can also be recorded on Amcrest Cloud instantly and the app can be set to send you notifications straight away too. You will get live viewing as well as a 4-hour storage free of charge. Or you can choose to pay for different storage plans- 7, 15 or 30 days and they start at $6 per month. You can record it to any Amcrest NVR, on your hard drive or an FTP server. You won’t miss anything regardless of where you are in the world. Amcrest Dome Camera (SCNEW-12279) weighs 9.4 ounces and measures 4.33 x 3.19 inches. It has the IK10 vandal-resistance and heavy-duty and weatherproof IP67 housing that makes it stay resilient under different weather conditions including rain, snow, and dust. It has an intuitive interface that lets you live-stream and plays it back depending on your choice. Your house, office or your loved ones will be safer with this new dome camera with the 4K high resolution very clear footage and Intelligent Digital Zoom. You will see everything in detail and pixel by pixel with the rich picture and vibrant colors. As you won’t need any electrical cables or a power outlet you can place the security cam wherever you want. And there will be a need for only a single power source for a PoE injector or switch. The Night Vision feature works with the IR LEDs that transmit infrared rays that are not visible to the human eye, hence offering you 98 feet night vision. 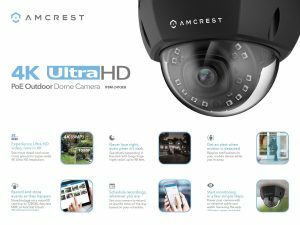 Amcrest UHD Dome Camera is very safe to use and holds certifications by FCC and CE and is UL compliant. There is also the USB backup feature to give you a peace of mind. It works with any DVR that has Ethernet cam inputs, but not with BNC or RCA camera inputs. The image resolution is super high and the quality is very good for how much it costs, with all the clarity, colors and sharpness you want. The Amcrest IP8M is offered with a year of warranty in the US as well as a lifetime customer and technical support. They will replace the camera if the camera is defective or when it stops functioning. It is rated 4.4 out of 5 stars by 10 customers’ ratings at the moment and is quite good value for money overall.